The Slumberdown Airstream is perfect if you want a cooler mattress topper that’ll soften up a mattress but still has plenty of support. It’s designed with, you guessed it, Airstream technology, this provides little air pockets that allow air to flow through the whole thing. A great alternative to memory foam this topper is filled with a polyester filling, so quite likely to be similar to your pillow, just a lot more stuffed! If you’re looking for a really soft topper than this won’t be quite right, but if you’re looking for something a little softer with good support but you don’t want memory foam then this is the topper for you. The cover is quite soft, a microfibre material, so it’s quiet under your sheet and there are the all-important elastic straps to keep it to your bed. It comes in three sizes; single, double and king. It’s 4.5 cm thick so not hugely thick but definitely perfect for propping up and old mattress or if you’re looking for a mattress protector that has a bit of extra comfort. Amazingly comfy and cooler than memory foam, the Airstream topper will revolutionise your mattress comfort. The topper is a whopping 4.5 cm thick so it’s deep enough to support your contours keeping your spine nice and straight. 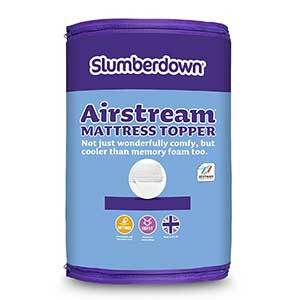 What’s more, it’s proven to be significantly cooler than memory foam thanks to Slumberdown’s clever Airstream technology. So you’ll stay cool and comfy all night long.